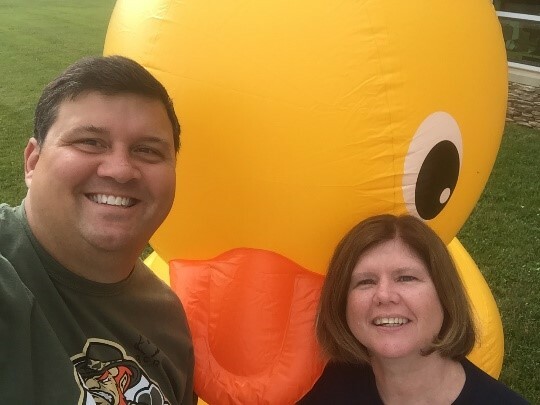 Councilman Sean Polster, Chairman of Warrenton’s Health, Parks, and Recreation Committee and Margaret Rice, Director of Parks and Recreation at the Warrenton Aquatic and Recreation Facility for the Warrenton Town Limits celebration. Three months after joining the HEAL Campaign in December 2015, the Town of Warrenton, VA implemented three HEAL policies including the Warrenton Aquatic and Recreation Facility’s (WAFR) on Wheels Policy to bring health and fitness education to kids and adults and, to improve employee health and wellness, the Commit to be Fit and Healthy Meeting Policies. Each of these policies reflects the Town’s commitment towards creating healthy practices within the workforce and within the community. In recognition of its HEAL work, Warrenton earned HEAL’s Gold Level recognition status at the 2016 Virginia Municipal League annual conference. In support of its HEAL resolution, the Town has drafted a Health Assessment to further its goal of implementing cohesive health practices for all community members. The Assessment has helped the Town determine how to strategically implement the HEAL vision of creating a more active and heathier community. Through this Assessment, the Town has implemented innovative practices to promote healthier food options at meetings, trainings, and events. The Town conducted a walkability audit and is working with a consultant to update walking trails to get people outside and moving throughout the winter. In addition, the Town helped move a weekly farmers market to a centrally located area in front of the Town’s Recreation Center. This change has brought over 15 new vendors and increased access and market use.